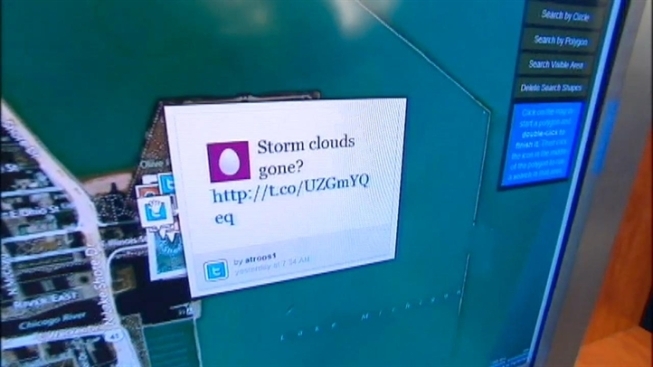 Service Shows Social Media at Navy Pier In Real Time. An Evanston, Ill.,-based company aims to give many businesses -- from restaurants and stores to news organizations and journalists to governments and first-responders -- a new way to look at -- and hear from -- the people they serve. Geofeedia is a subscriber service which allows approved users to zero in on any location -- a building, a neighborhood, a town or even a country -- by either circling it online on a map or typing in an address. Then the user pushes a search button, and up pops every Tweet, Instagram, YouTube video, Flickr or Picasa photo coming from that location -- as long as it has been geotagged. "Geotagging" is the process by which social media users can mark their posts by location. The posts are then mapped on the individual websites. Geofeedia takes this mapping data from five websites and aggregates it into one location. It therefore makes it possible for someone to start with a location -- without knowing anyone in particular -- and discover anybody and everybody who has posted there. In a matter of minutes, a complete stranger can now conduct a kind of virtual surveillance on people in a specific location, without any of them ever knowing it, in near real-time. The result is mesmerizing -- showing an array of chatter and photos and missives. It can also feel a little voyeuristic, even though the people have willingly tagged their messages. 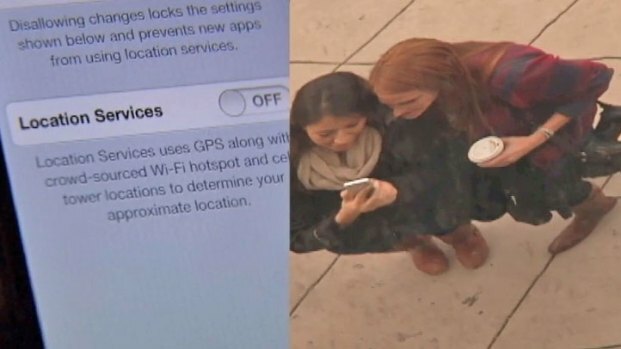 And it illuminates an issue with geotagging which could pose dangers to families and children. But if done right -- and with restrictions -- it also has all kinds of potential, according to Phil Harris, Geofeedia’s CEO. "Everyone is using social media, especially younger adults," said Harris. "But there’s so much data that it’s hard to find information that’s useful to you as a consumer or a business. With Geofeedia location services, [people] can actually tell others where they are, and what they’re experiencing there in real time." Harris sees Geofeedia as a business tool. "Individuals have the ability to express how they feel about an experience at a restaurant -- did they have a good experience at a store, or did they have a good experience when they went on vacation to Florida," he explained as examples. He said a business could monitor its customers in real time and respond to them immediately and directly. Geofeedia can also help journalists and news organizations, especially in breaking news situations. Reporters and news desks can monitor a story as it unfolds -- be it a fire or a hostage situation or a union protest -- while getting real-time, unfiltered perspectives from the direct participants on the ground. In fact, Geofeedia has just introduced a streaming service, where users can stream two, three, or even more concurrent locations to see the latest postings from each website. Harris also pointed to "Superstorm" Sandy. In an instant, a first-responder using Geofeedia could call up videos and tweets posted in real time, focusing on a particular area to zero in on people needing immediate help. Harris said several towns are currently using the service and he hopes it becomes a common way for people to reach out in emergencies or other situations where immediate help is needed. Harris noted that his company takes care to screen people who want to use the service -- double-checking e-mails and vetting potential users. But he also notes that Geofeedia is simply aggregating technology that is already available on individual social media sites. In other words, Geofeedia is not making anything public that isn’t public already from its original source. Geofeedia just makes it all easier to find. "We’re developing new ways to use Geofeedia every day," said Harris. "We’ve been overwhelmed with the amount of interest. It all comes down to the basic fundamental that people just want to be heard. That’s the underlying trend. We’re just providing a way for organizations to access that data."